So I had the mentality of going into this game with an IDGAF mindset, seeing as the name is menacing, the levels stacked to nine, and a feeling in the pit of my stomach knew this wasn't going to be easy. Unfortunately, I was right for the wrong reasons. This game surely does leave a first impression. While the style of "Where am I, what's going on?!?!" is surely becoming outdated, the way it is presented in this game is stylistic, with a scenery that is pleasant to the eye and gameplay to match the tip of your fingers. They did mend each of these aspects well, allowing the player to read the story and understand what IS, indeed going on, while still being able to fight. This is an important aspect of games that have a story that many people forget about. (You can't fight a ninja while reading a paragraph, it's just not possible, trust me, I have tried). The graphics match up well, and nothing is too overdone, or underly cooked. Basically, what CG and Achievement cooked up was destined for success, until destiny said "hey, not so fast." It pains me to start criticizing this game rather than continue on about it's impressive ups. However, even little flaws in a big game can have huge consequences. If this was not intended, well, lesson learned to be more careful. However, if you two meant for this, then I ask, why did you decide to put a jetpack two inches in front of some huge buff monster and two inches after you get done swimming through a path of lava. Like, were you just trying to torture the players who decided to stick it through? That anecdote, or story, sums up my feelings of the majority of the negatives of this game. Frustrating, unnecessary gameplay that takes away from the game, more than anything else. Okay, so some parts were frustrating. We get that, but that happens in a lot of games, right? Sure, however, I would like to go back to my statement, and the title of this review, a little word I would like to call "potential." This game was chalk full of it, and easily could of been hailed as one of the greats. However, the random moments of insane difficulty subtract from the overall vision you two were going for. If this game kept the same smooth pace, where everything seemed to be right in front of you, then this game would have been a winner. The parts I did enjoy, which was basically 90% of the game, were truly a pleasant experience. Nothing was so remarkable, yet, it seemed like everything pieced together perfectly, in a compact, yet big way. However, the enemy placement did seem as if you two did not really think things through. 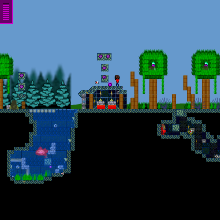 As some enemies, as such as many bats you placed, were in awkward positions where they kept biting my big block head. But, to combat the sometimes awkward enemy placement, you two did an amazing, truly remarkable job at making the game accessible. The puzzles were not made to confuse and annoy, but rather to help you explore and point you in the right direction. SO close, yet so far. A game that, while definetely having its flaws that will make some Sploder users give up, has many qualities that will push the others forward to hopefully beat this game, and give it all it has to offer. Unfortunately, I made it to like Level 7. I encourage the rest of Sploder to step up and be the first to pass me, and beat this game.